Gerald Anderson admits that one important lesson he learned in showbiz is that no matter how hard he tries, it is impossible to please everyone. 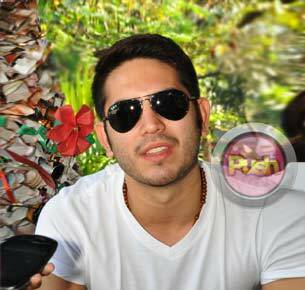 This early on, Gerald Anderson is excited about his next teleserye Bukas Na Lang Kita Mamahalin. Taping for the project is currently ongoing and the actor was happy to announce that work is enjoyable because everyone is happy on the set. Gerald was also enthusiastic about working again with Dawn Zulueta, whom he worked with in the film Catch Me, I’m In Love in 2011. The actor only had good words for the seasoned actress as well as his leading lady Cristine Reyes. Another reason for Gerald to celebrate is the nomination of his previous teleserye, Budoy in the drama category of New York Festival World’s Best Television and Films competition. The said film festival will take place in Las Vegas, USA in April. Gerald added that he might not be able to attend the awarding ceremony of the said event because he might be taping for his teleserye during that time. In the meantime, Gerald is trying his best to deal with the issues surrounding him. Gerald is currently under scrutiny because of his romantic involvement with Maja Salvador, who used to be best friends with Gerald’s ex, Kim Chiu. He shared that one important lesson he has learned in the years he has been in showbiz is that he cannot please everybody. He also cited social networking sites as a popular avenue for critics to bash other people. Gerald said that he has no Twitter account but has one in Instagram. He did not deny that some bashers post their comments on his page, but he added that people are entitled to their own opinion. He continued that he tries not to waste his time reading comments from detractors. To be more productive, Gerald said that he keeps himself busy with work. He said that he just enjoys the compliments that people give him for portraying a role effectively. “Alam mong may ginagawa kang tama kasi parang lumabas namang maganda. Masaya ako sa mga ganon,” he shared. Besides, Gerald said that he has the full support of his family against the intrigues. “Kumbaga sila ‘yung supporters mo, sila ang nagmamahal sa ‘yo no matter what. [Kung anuman] ang gagawin mo through success and failures andyan sila,” he related. He also shared that his dad’s only advice to him is to stay strong, follow his heart, and do what makes him happy.